THE mightiest of all Rosary victories was the battle of Lepanto. The Mohammedons, at the peak of their naval power in the Mediterranean, threatened to overrun Christian Europe. In this extremity Pope St. Pius V formed a league against them. The Christian fleet, furnished by Venice, Genoa, and, Spain, was commanded by Don John of Austria. As early as September 17, 1569, Pope Pius enjoined the recitation of the Rosary on all Christendom for the success of the Christian arms. He had ordered all the churches to have the Forty Hours Devotion, with public processions and recitation of the Rosary On that fateful October 7th, he himself spent the entire night in prayer. Before moving to the attack at Lepanto the Christian sailors devoutly recited the Rosary while the Papal Legate gave the Apostolic Benediction to them. For three hours, the sixty-five thousand men, all of whom had received Holy Communion that morning, continued to recite the Rosary. Then on each ship general absolution was given for the last time by one of the chaplains. The attack began. The wind, which had been against the Christians, suddenly dropped. The battle raged until late in the afternoon, when the Turks gave way. 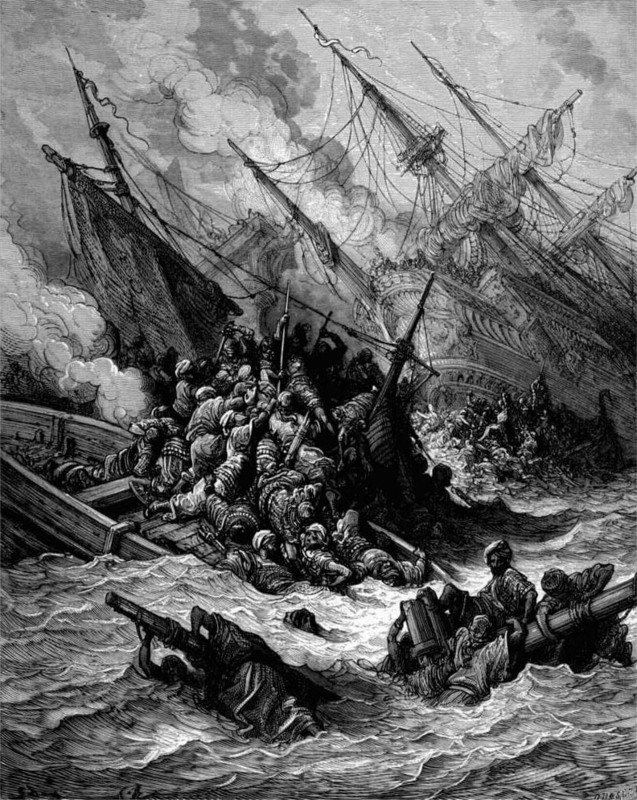 The victory gave the naval power of the enemy a blow from which it never recovered and ended their threat in the Mediterranean Sea. From the very first Don John ascribed the triumph of his fleet to the powerful intercession of the Rosary Queen. The Venetian Senate wrote to the other States which had taken part in the Crusade: It was not generals nor battalions nor arms that brought us victory; but it was Our Lady of the Rosary.